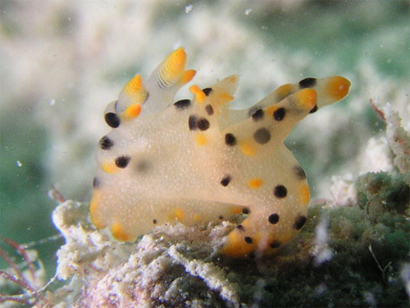 Look at this bizarre looking nudi photographed at Hantu on 14th Nov by Stanley Tan. If there's any reason why aliens haven't been found in outer space, it's because they're right here - in inner space! It's head is on the left end, you can tell by looking for the rhinophores. This was a tiny tiny creature. See more of what Stanley saw that Sunday. Thanks for sharing your pix with us! 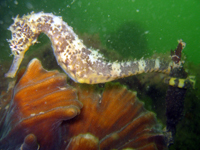 This lil'seahorse was photographed at Hantu on Sunday 14th November. Billy was one of the divers who joined our Blog dives earlier this year. I was diving with friends two weekends ago. I happened to be the only person to spot two seahorses clinging onto the pillars of the Hantu Kecil Jetty. One was at 5m and the other at 3m, both were about 10-12cm. They weren't easily spotted because they kept going into the algae for cover and were pretty shy initially. I stayed with them for about 30mins until they were comfortable enough to allow me these shots. Thanks for sharing your pictures Billy! Billy was one of a group of photographers who visited Hantu island to document her shy and cryptic creatures. Boy! Did they do a good job! 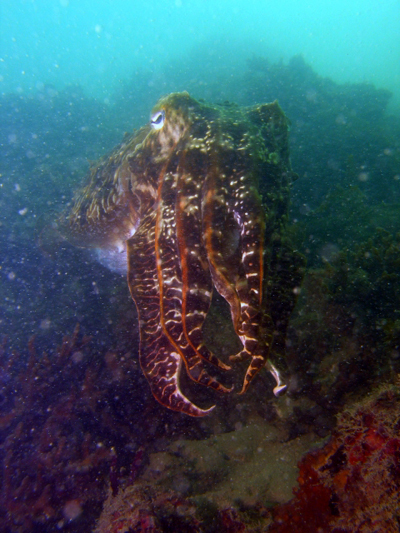 "Hello.." Says Jesse the Cuttlefish, who lives at Hantu. "It's been a long time, I haven't seen divers for a awhile. Was wondering were you guys've been." Jesse likes to hang out in the shelters of the Hantu Kecil Jetty. His excellent camoufladge keeps him well safe. But it seems he doesn't rely too much on camo because here he is in all his red, orange and white splendour! That makes it easy for divers to spot him. 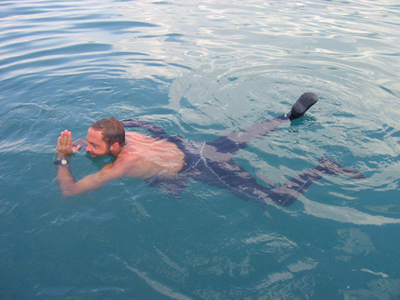 But most of the time, we believe, it's Jesse who comes up and says hi to the divers. "You must be here cos there's a monsoon on Malaysia. Yeah.. That's why I like it here too. You know you're always safe and sheltered. Anyway, heaps of my mates here by the jetty like to get together for tea on Sunday afternoons. Drop by if you have the time!" "WAAAAAA..." If that's what you're saying when you're looking at the worms above then that's just what we said too when we ran into them in the depths of Hantu. 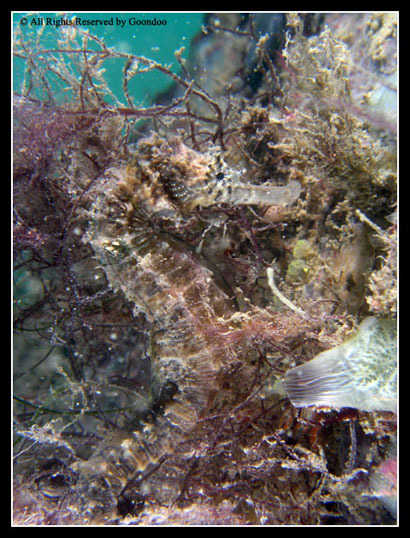 These were photographed on Saturday mostly on the silty seabed of Hantu's northern channel. Aren't they just beautiful? Yes, all these in a day! Well 4 of them are worms, two of them are sorta slugs. Can you tell them apart? 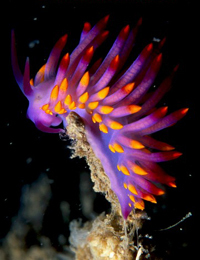 It's crazy to discover these gorgeous animals in our waters. Our minds were really blown away. The environment looks almost inhospitable, yet these guys can sometimes be encountered swimming in midwater, to what seems to be nowhere! It's incredible and very exciting and encouraging. Other things were saw were snappers, defensive damsels, dragonets, carpet eel blenny, icon starfish, pinna fanshells, gobies, and heaps and heaps of crabs. 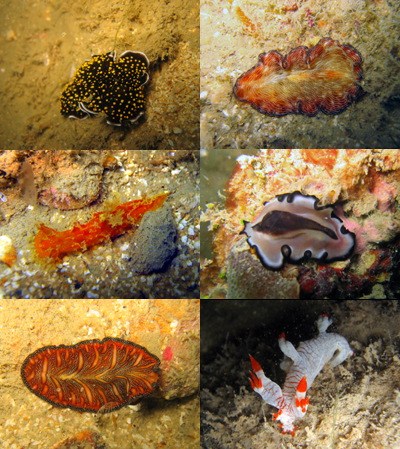 On Saturday, the Hantu Blog ran a special dive trip for marine biologists, and divemasters, the two groups of people who make enjoying the seas all possible! We wouldn't know anything about our seas if scientists aren't out there making discoveries for us, and we won't be able to dive safe without the assistance of divemasters, who also work hard so our dives can be fun. It was a great trip for everyone because for once, the scientists weren't at work, they have no task, they can just dive, go deeper (alot of surveys are done at 3-6m) and see the stuff that's there (Did I mentioned we had 4m vis!!!). We could fool around and not worry about getting tangled in a transect line. 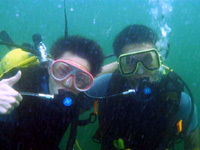 For most, while it wasn't their first dive at Hantu, it was their first leisure dive at Hantu! Chris and Paul. Isn't the sky gorgeous! We were blessed with wonderful weather as you can tell from the pictures. Glorious fluffy clouds and clear blue skies. The currents however got a little naughty during our second dive, taking a turn in the middle of the dive, leading us to fin, fin, fin! But we still saw heaps of stuff! It was nudis galore and their pix will be running through the Blog over the next few days/weeks. We met with an awesome storm on the way back. 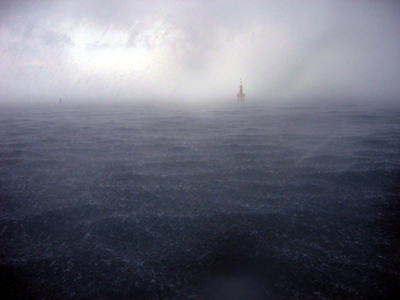 The dark sea and heavy rain was so impressive. A perfect ending. Hantu Bloggers get in line! Volunteers working hard along a transect line. 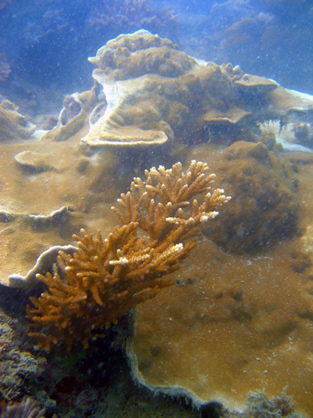 How do scientists know what's on our reefs? Well... with alot of effort that's for sure! But it's nothing you and I can't do! Hantu Blog dive guides along with several SIF volunteers attended workshops by marine biologist Loh Tse-Lynn to learn all and more than you'd ever dare to ask about corals, coral reefs and coral reef ecology! Not only did we learn to identify coral (which seemed pretty daunting at first but Tse-Lynn made it alot more comprehensive and fun! Which made learning SO much easier and entertaining!) we learnt about significant fish species and their role in our reefs. Of course, we didn't forget to pay attention to the elusive and sometimes bizarre invertebrates like sea cucumbers and shrimp! 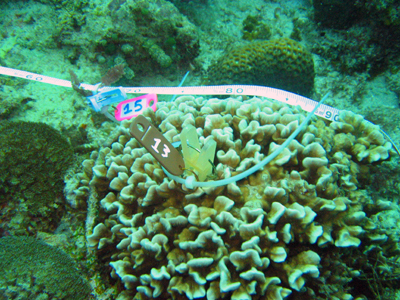 The test: Tags along a transect line point at reef organisims and substrates that volunteers are to identify. Volunteer divers also got to hone in on dive skills because a great deal of hovering and bouyancy control was necessary to survey the reefs. Moving slowly along the transect lines meant paying more attention to the nitty gritty, garnering greater appreciation of our reefs and their mind-blowing biodiversity! 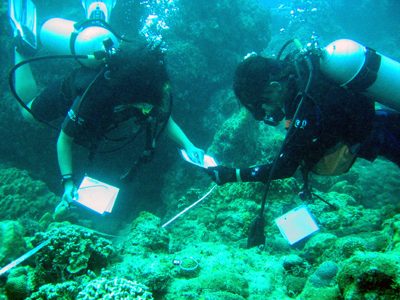 Volunteers were preparing to survey reefs in Surin, Thailand, as part of the SIF's Youth Expedition Project (YEP), and the Hantu Blog guides plan to put their newly acquired skills to better understanding of our very own reefs at home! The pix are beautiful! Thanks for sharing them Jim! More of our Southern Islands' beauty and surprises have been revealed! 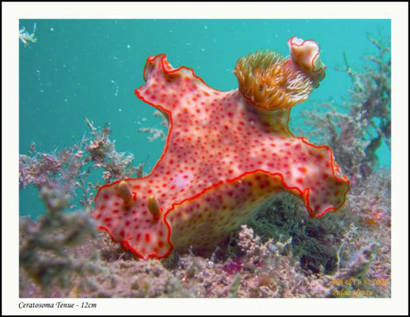 The sea slug you've photographed certainly looks like C. tenue but it could also be C. trilobatum, which has a very similiar colour and shape. 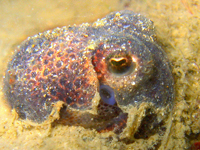 C. trilobatum can be distinguished by having only one large lateral lobe on either side of its body, just anterior to the gills. C. tenue has 3 mantle lobes on each side of the body. There is usually a ridge joining each lateral lobe to the anterior head lobe, however this can be difficult to observe. The background colour can vary from pale green to orange-red or brown, and generally is mottled and spotted with lighter colours. There are usually small yellow or orange spots and the edge of the mantle, and sometimes the foot, is bordered with a broken or continuous purple line. It is always useful to take note of the depth and substrate in which the animals are encountered. Size is certainly very useful too, as you've taken care to note! 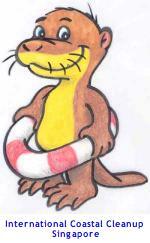 C. tenue is known to occur in depths of 2-10m and in sandy rubble areas. It is also understood to grow to a maximum length of approximately 10 cm, and comes in a variety of colours. When taking pictures, it's helpful to take several angles, just to assist in its identification, paying attention to unique or outstanding attributes. If you've got pix you'd like to share, email us! 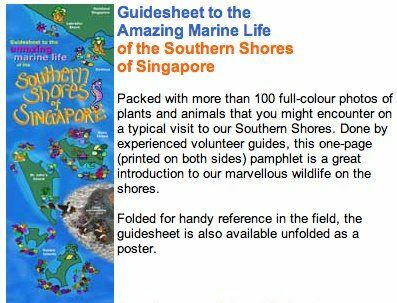 WildSingapore & Blue Water Volunteers have got together to produce the Southern Islands brochure. It will be on sale at the Official Launch of Clean & Green Week 2004, from 9am to 7pm, at the open field next to Yew Tee MRT Station. 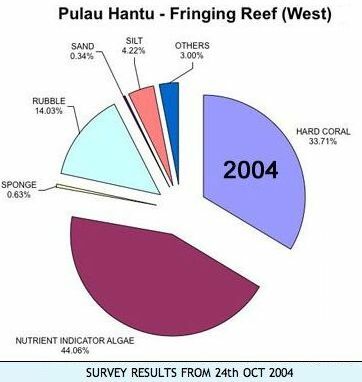 The Blue Tempeh reports on the latest Reef Friends dive survey - at the patch and fringing reefs at Pulau Hantu - read the The Blue Tempeh for the energetic report by Jani! 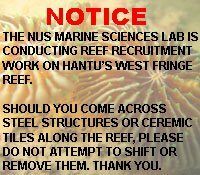 Earlier data from the Reef Friends project is posted here.